Through tenacity and perseverance, our Company is determined to provide high-quality finished products to OEM manufacturers and end-users. With a focus on employee development and involvement, we incorporate six sigma-quality processes within the workplace to deliver our products and services on time, correct the first time, and at a competitive price. It is our goal to provide our customers with a product that meets or exceeds the product specifications, is delivered on-time, is correct the first time, and at a competitive price. North Coast Tool, Inc. fosters an environment of continuous improvement through employee involvement, staff development, and innovation. Our experienced toolmakers, fabricators, and advanced design engineers are qualified to build products limited only to your imagination. 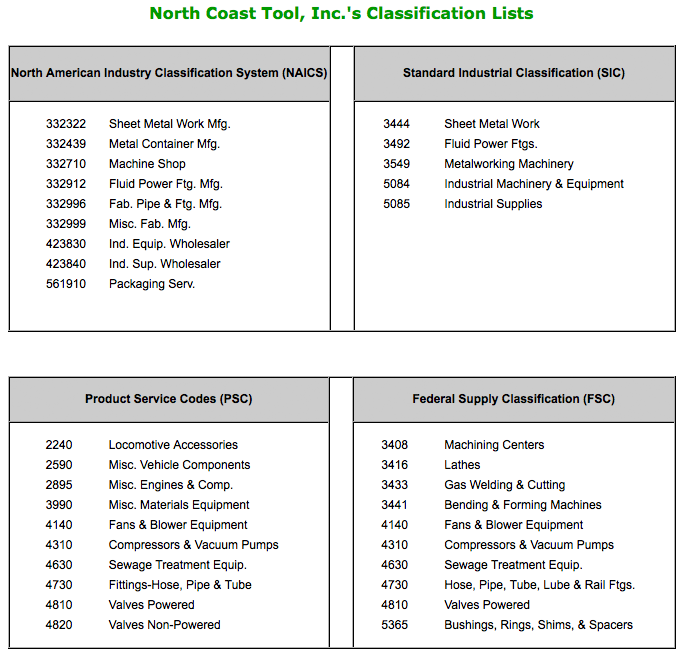 North Coast Tool, Inc. will, at its option, replace or repair without charge to the original purchaser, any part or parts found upon examination to be, DEFECTIVE IN MATERIAL and/or WORKMANSHIP, if received for such examination within 90 days from the original date of purchase. Damage resulting from accident, product abuse, or neglect are conditions under which the warranty cannot be claimed. Warranty does not apply to damage or personal injury resulting from the failure to follow the manufacturer's operating instructions. Certain products may have specific warranties applying only to that product. Contact North Coast Tool, Inc. for details. All freight charges on warranty claims shall be paid by the purchaser. No other warranties, either expressed or implied, will be the responsibility of North Coast Tool, Inc.
All invoices are 2% 10 / Net 30 with a company purchase order and approved credit. To be considered for credit, please print and complete our Credit Application. Fax the signed Credit Application to the attention of Dale Rapela at 814-402-1736. Copyright© 2006-2017 North Coast Tool, Inc. All rights reserved.